Two thousand years after the fact, new light is shed on Christ's hidden life as an initiate in the mystical society of the Essene Brotherhood. 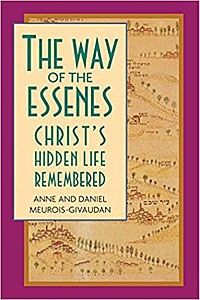 In the first English-language edition of the European bestseller, Anne and Daniel Meurois-Givaudan describe the way of life in the Essene communities of first-century Palestine. Through direct revelation, the authors received--over a two-year period--detailed knowledge of the Essene teachings and their role in preparing Christ for his mission. At once unpretentious and astonishing, this beautifully written and evocative story lucidly recreates the life and personality of Christ and his role in the spiritual development of humankind. Since the discovery of the Dead Sea Scrolls, questions continue to arise as to the identity of the Essenes and what role they might have played in the life of Jesus. This account complements the gospels, clarifying and enlarging upon mysterious parts of the record--including Christ's mystical and metaphysical teachings of Essene techniques for spiritual advancement. The authors’ retelling of the Passion of Christ and its aftermath is an extraordinary account that may forever reshape our understanding of these biblical events.